The Bryce Canyon National Park is without a doubt one of the best places for hiking. 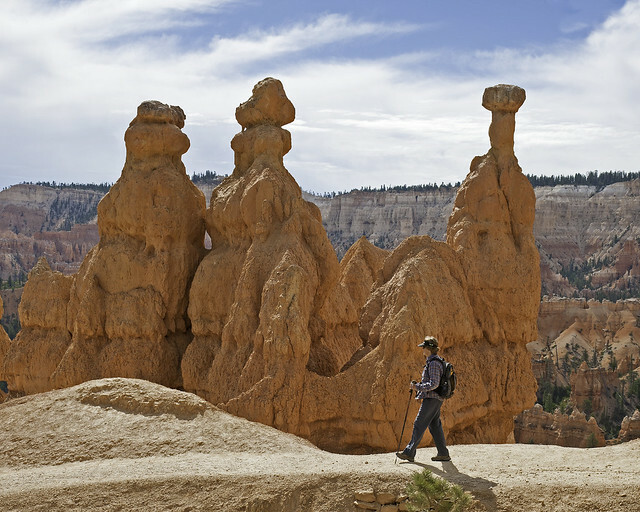 With all those hoodoos that create amazing mazes, some may think that it is quite difficult to hike in this area, but it has actually breathtaking views which makes your hiking experience memorable. What is nice in hiking at this park is that the descents are not too tough. So, this should not stop you from enjoying hiking activity in this area. And since Bryce Canyon is situated at a higher elevation about 8,000 ft., you can experience a cooler weather compared to St. George and other National Parks. Compared to Grand Canyon, this park is much cooler. Just make sure that when you go out on a hiking trip, you prepare the necessary items that you need from bringing with you water to other basic essentials. This is considered to be one of the best areas for hiking. In fact, many hikers consider this place as one of their favorite hiking trails. It features a 5.5 mile loop with a combination of 3 loops giving you access to the best of the area. When you start your walk, you can see the hoodoos, arches and the canyon. For the best hiking experience, it is strongly recommended that you start at Navajo Loop Trail. This is not so popular among hikers, but can still be one of the best hiking places at Bryce Canyon. What is nice with Swamp Canyon Loop is that it offers you a greener view. All throughout your hike, you get to witness the pines and firs. The southern part of this 4.3 mile loop is connected with Under the Rim Trail. The hoodoos are not too impressive here, but this trail is popular among hikers for a reason. For one, it is part of the backcountry trail system which is the Under the Rim Trail. With its steep slope stretching across 1.5 miles, this is a challenging trail that everyone should try.